This is an album of original acoustic guitar instrumentals recorded by an artist who is as much known for his voice as his guitar. On previous albums Alan had always included one instrumental tune. After having been persuaded to record an all instrumental album, Alan sat down last Winter, at home with a couple nice mics, an old 'tube' pre and recorded to tape by the fireplace a collection of eleven instrumental pieces, just himself. Most songs are arranged as two guitars and bass, although one song also contains some 'sparse' fiddle lines also played by Alan. The finished product captures the warmth of the stone house in which it was recorded, as well as the 'crackle' of the fireplace here and there. A bonus track after the last song. is of "Windy" our' dog, who passed on towards the end of the project in May, fading into the sound of the 'gentle rain' that fell all night on the night she left us. 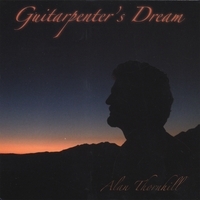 Alan is an award winning guitarist(The Telluride Fingerstyle Guitar Championship) as well as an often covered (and award winning)songwriter and unique and powerfully soulful singer. Say to Mark Ackerman For me. It is wonderful and moving. I start my day with it and end my day with it. It is truely peace through music. We love this CD. My husband says it sounds like it came out of a good heart and the fine air of Ojai. It expresses so well the feeling one has when there. What a wonderful CD. I am so happy to add this new one to my collection of Alan's incredible work. He is truly a master at writing, playing and singing.